Following a night of protests in Ferguson that resulted in shots fired, demonstrators continued to make their voices heard Monday as St. Louis County declared a state of emergency in an effort to maintain order. The renewed protests follow the one-year anniversary of the Michael Brown shooting. A black 18-year-old man, reportedly a friend of Michael Brown’s, was shot by police on Sunday. Tear gas was fired after a day of commemoration during which hundreds of people took to the streets of Ferguson. Police have said the "12-year-old girl" who was arrested is actually 18 years of age. Woman arrested was not 12 yoa, but 18. She's 1 of at least 9 arrested in accordance w/State Charge 575.150: Resisting/interfering w/arrest. 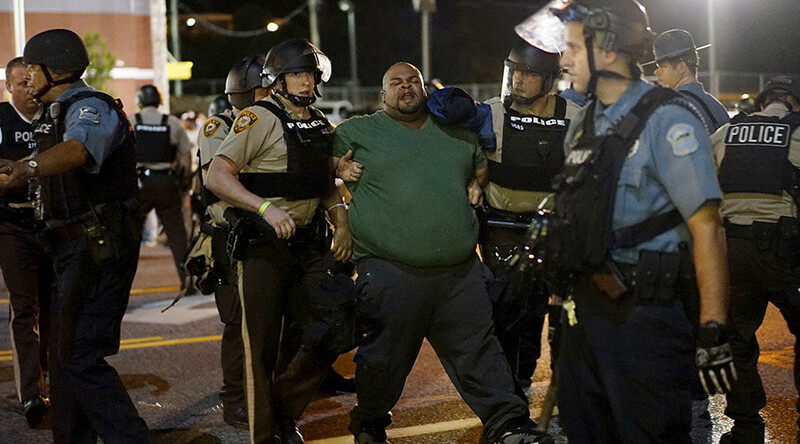 Dramatic photos of police arresting and facing off with demonstrators in Ferguson tonight. A 12-year-old girl has reportedly been arrested, according to accounts on social media. Demonstrators have linked arms as police stand on the other side of the street. A drone has reportedly been sighted above the protest. Police have reportedly started making arrests and kicking people off the streets. According to law enforcement, frozen water bottles were thrown at officers. Police say rocks and bottles have been thrown at officers near W. Florissant. Hundreds of people are reportedly out on West Florissant. Some protesters are questioning the police's use of riot gear in the face of peaceful demonstrations. The evening in Ferguson has been quiet compared to the flurry of arrests made earlier in the day. A few marches peaceful have been reported.